Jenny originally learnt to knit but began crocheting at the age of 8 because she desperately wanted a crochet bun cover like ballerinas wore on their hair. Her maternal aunt showed her how to chain and dc(Aussie) and make one. While visiting her paternal cousin she discovered the granny square stitch and within a week was way faster than her cousin. And she had learnt the treble. The rest is history. The rug became a 4 square poncho that Jenny decided need a funnel neck. This became her first original design that she wore and wore. Once Jenny realized that she could crochet much faster than she could knit it became her craft of choice. By 12 she had made her first crochet bikini. Patterns were plentiful in the 70's and could be found in every magazine and newspaper. That helped fuel her addiction. From 15 to 22 Jenny was crocheting bikinis commercially and was offered a position as designer with DMC Australia. Jenny decided to keep her craft as her hobby and continued her high school teaching career instead. She did however use DMC thread to crochet her wedding gown. Jenny raised 3 children with her husband and began writing and self publishing books while they were in high school. Jenny is surrounded by vibrant colour as she lives in Tropical Queensland just 2 blocks from the beach. This colour inspires her designs. 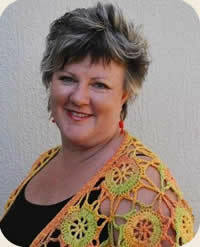 Specializing in crochet only, Jenny is a passionate teacher with 30 years experience both in Australia & USA. Jenny is also a yarn store owner and has 13 books to her name. Jenny is the first Australian to attend a CGOA conference and was the Guest speaker at professional development day the very next year. She has been teaching at these conferences whenever she can get there. She was also Banquet speaker at Crochet Renaissance and winner of the international crochet awards for her plaid afghan and 3rd place for her crochet beaded bag. She has had the pleasure displaying her work as the Featured Artist with Expertise Events, the largest event organizers in Australia, in all capital cities in Australia and also in New Zealand. This gave her the opportunity to teach hundreds of people to crochet and reignite the passion in others. Jenny is dedicated to revitalizing the Art of Crochet. WORK FEATURED IN FOLLOWING PUBLICATIONS AND MEDIA - Crochet for Fun and Profit, Cover design for Today's Crochet( back cover also), Cover for New ideas for Today's Crochet, 100 hats to knit and crochet Crochet! Magazine, 2 covers Yarn magazine, Featured artist in Creative Knitting, Australian Crochet, Australian Knitting, Australian Craft and Decorating, Melbourne Sun Herald, Get Creative Magazine. Published articles in numerous newspapers all around the country as the featured artist for Expertise Events (the largest events organizers in Australia and NZ), Better Homes and Gardens Television show, Brisbane Extra TV featuring her Crochet bikinis and one piece swimwear. Soon to be featured in Masters of Crochet.